Sick of getting stuck in traffic? Trying to avoid the “fuzz”? Can’t remember where you parked your car? Well, like the cliché goes: there’s an app for that! We’re willing to bet that you carry your smart phone with you everywhere, including in your vehicle (but we hope you’re not using them while driving). Smart Phones are great for a lot of things and help us live our lives more efficiently. According to the latest American Driving Survey from the AAA Foundation for Traffic Safety, American drivers spend an average of more than 17,500 minutes driving annually. As that number continues to grow and our phones become more integrated with our daily routines, it’s no surprise that there are some pretty amazing apps designed for car travel out there! From locating your parked car in the King of Prussia mall parking lot to finding out in real-time which route will get you to work the fastest, the 10 apps below can help make your life a little easier and a lot less frustrating. In fact, with the best driving apps installed on your phone you may find your life behind the wheel a little bit less frustrating! Obviously, there are several mobile apps designed to help drivers navigate their way around from place to place. However, map apps are just the beginning. There are also mobile apps that help you get better gas mileage, avoid getting tickets and help you find just the right place to visit on a road trip. So, let’s take a look at some of the best car apps available. They include apps for all kinds of purposes. Few mapping apps can hold a candle to Google Maps. It’s simply the best out there. Better still, the app syncs your desktop searches to your mobile device and it can integrate with Waze. The bottom line is there are many great mobile apps for drivers, but these listed above make up some of the best driving apps on the market. If you’re looking to avoid tickets, save on gas, find electric chargers or any of the other useful pointers these apps provide, then check out some of these apps today and see which one’s work best in your day to day life. Call or visit Badell’s Collision in Aston or Malvern, Pennsylvania for auto body repairs you can count on. You can also use our online quote form. 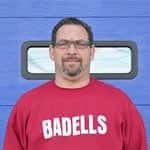 Brandon Badel is the owner of family-owned Badell's Collision. Brandon's "customer first" approach and true commitment to going above and beyond is what distinguishes him from other local shop owners. Brandon is proud to have two locations to better serve Chester and Delaware County car owners, and looks forward to a future full of success for his team. Brandon Badell frequently blogs for Badell's Collision, Inc .